Our Founders have the vision to be a household name all over the world. With so many years of experience successfully operating multi-million dollar businesses on nearly every continent, our Founders have pioneered efforts to expand SEACRET across the globe and see their vision come true. Now, SEACRET officially operates in the United States and its territories, Canada, and The Republic of Korea. In addition, we have expansion activity going on in Australia, The Dominican Republic, and Mexico. And we're not stopping there! Select a country from the dropdown list to learn more about SEACRET Direct's International Opportunities. Seacret Direct has now officially launched in Australia and the future is looking bright! With an ever increasing number of Agents and Preferred Customers on-board, Seacret Australia is proving itself to be one of the fastest growing relationship marketing companies in the country. To share this exciting opportunity with friends, family or colleagues please refer to the details below. Complete and submit your SEACRET Agent application online at your Enroller’s replicated website or email it to support@seacretdirect.com.au. The minimum purchase requirement to register as a SEACRET Agent in Australia is the Registration and Launch Kit ($70 AUD). However, a SEACRET Agent is considered "Active" only if they have at least 35BV or 200TPV within 4 consecutive weeks. See a list of all available products at seacretdirect.com – make sure to choose the country of Australia. Commissions, incentives and bonuses are remitted in Australian dollars and paid on a weekly basis, including Retail Commissions, Preferred Customer Commissions, Team Commissions, Leadership Match, Superstar Bonuses, Car and Lifestyle Bonuses. All Commissions earned by the pay-period deadline (Sunday 11:59pm PST) are paid the second Friday after the close of the period. The "Enroll 4 Pay No More" amounts are credited on a monthly basis. Earnings are paid by direct deposit in Australian dollars. Please allow 24 to 48 hours for processing. SEACRET is now doing business in Canada as Seacret Skincare Inc., a Canadian company making it even easier for our Agents to sell product and build success in Canada. If you have friends, family or colleagues in Canada who may be interested in SEACRET, the details below may be helpful. 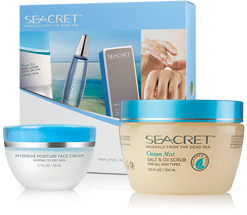 The minimum purchase requirement to register as a SEACRET Agent in Canada is the Registration and Launch Kit ($59 CDN). However, a SEACRET Agent is considered "Active" only if they have at least 35BV or 200TPV within 4 consecutive weeks. See a list of all available products at seacretdirect.com - make sure to choose the country of Canada. Commissions, incentives and bonuses are remitted in Canadian dollars and paid on a weekly basis, including Retail Commissions, Preferred Customer Commissions, Team Commissions, Leadership Match, Superstar Bonuses, Car and Lifestyle Bonuses. All Commissions earned by the pay-period deadline (Sunday 11:59pm PST) are paid the second Friday after the close of the period. The "Enroll 4 Pay No More" amounts are credited on a monthly basis. Earnings are paid by check in Canadian dollars. Please allow 3-7 days for delivery. Seacret Direct Korea Co. Ltd is one of the fastest growing relationship marketing companies in the Republic of Korea! Thanks to our SEACRET Agents, SEACRET Korea is no longer a secret! If you have friends, family or colleagues in Korea who may be interested in SEACRET, the details below may be helpful. Please note that a copy of the Residence ID Card and a copy of local Bank Account book to which future commissions will be deposited by Seacret Direct Korea will need to be submitted before the application is considered complete. The minimum purchase requirement to register as a SEACRET Agent in Korea is the Launch Kit (KRW 29,900). However, a SEACRET Agent is considered "Active" only if they have at least 40BV or 200TPV within 4 consecutive weeks. See a list of all available products at seacretdirect.com - make sure to choose the country of Korea. Commissions, incentives and bonuses are remitted in Korean Won (KRW) and paid on a weekly basis, including Retail Commissions, Preferred Customer Commissions, Team Commissions, Leadership Match, Superstar Bonuses, Car and Lifestyle Bonuses. All Commissions earned by the pay-period deadline (Sunday 11:59pm PST) are paid the second Monday after the close of the period. Earnings are paid by direct bank deposit, and remitted in South Korean Won; bank deposit information should be included on the SEACRET Agent application in order to assure correct and timely payment of commissions, incentives and bonuses. SEACRET has initiated its first phases of operation in Mexico, with expectations to officially launch at kick-off events in the near future. During this pre-launch phase we are enrolling Agents and Preferred Customers, taking and shipping orders, and processing commissions; however, we are still fine tuning procedures and systems, and appreciate your patience in resolving any minor issues as they are encountered. If you have friends, family or colleagues in Mexico who may be interested in SEACRET, the details below may be helpful. The minimum purchase requirement to register as a SEACRET Agent in Mexico is the Registration and Launch Kit ($49 USD). However, a SEACRET Agent is considered "Active" only if they have at least 30BV or 200TPV within 4 consecutive weeks. See a list of all available products at seacretdirect.com - make sure to choose the country of Mexico. We are currently in a pre-launch stage to allow you to start building your business in Mexico as soon as possible and we are currently taking registrations and product orders in US dollars. We anticipate a change to the local currency (Mexican Pesos - MXP) in the near future. Commissions, incentives and bonuses are remitted in Mexican Pesos and paid on a weekly basis, including Retail Commissions, Preferred Customer Commissions, Team Commissions, Leadership Match, Superstar Bonuses, Car and Lifestyle Bonuses. All Commissions earned by the pay-period deadline (Sunday 11:59pm PST) are paid the second Friday after the close of the period. The "Enroll 4 Pay No More" amounts are credited on a monthly basis. Earnings are paid by direct deposit in Mexican Pesos. Please allow 24 to 48 hours for processing. Seacret O Direct S. de R. L. de C. V.